Have you seen this trailer? If you do…stop by and say ‘hi’. One of my sponsors Tekonsha, the leader in electronic trailer brake controllers, put a wrap on our horse trailer. There are times that it is fun to have a wrap on the trailer and there are times it is a bit awkward. The only time it really isn’t fun is when I’m doing something silly…like wearing sweatpants and cowboy boots into a gas station when someone recognizes me…lol. …otherwise it can be fun. It is a great conversation starter while fueling up or if people want to come over to visit the horses. Even when people don’t have a clue who we are they will often ask if they can pet the horses or take pictures of them. It is always fun to see people who are in awe of these big animals but don’t have as much access to them. Watching a child squeal in delight at touching a soft horse nose is always fun. So if you see us driving down the road, like this man did, stop by and say hi. Take a photo or be prepared…I just might ask YOU to be in a photo or video. Tekonsha thought it would be interesting to do some videos called “Stops with Stacy” where I show you even more about the interesting things that go on in our travels. Pretty neat idea, right? Watch for the first ‘Stops with Stacy’ in my blog on Monday. If you have time leave a comment with ideas on what you would like to see featured in a ‘Stops with Stacy’ episode. Most importantly, stop by and say ‘hi’…and be prepared to be on camera! ← Any tips or guidance on to how to prepare for the first ride…after a long winter? I’d love to see this trailer and get to meet you. I won’t even think twice about the sweatpants, probably three times. Lol. Safe travels to you and your family…. We saw you in either at EquiFest of Kansas or Horsefest in Springfield, Mo. a few years ago, can’t remember since we usually go to both. You should come back to Kansas again! I’ve enjoyed your horse blogs with Jac. Been there, done that, with the sweats and boots, gotta be comfortable, right? I’m a bit too far north (Minnesota) to have the opportunity to catch a glimpse of your rig but I sure would enjoy following you in a pictorial of your journeys. Safe travel to you and yours. I’d love to see this trailer and get to meet you. I won’t even think twice about the sweatpants, probably three times. Lol. Safe travels to you and your family. I’d crash my truck if I saw you in our town or even on the highway! Lol. Eyes are open. Sweat pants and cowgirl boots are a good reminder to all that Stacy Westfall is STILL a regular human being with needs. Blessings on your travels. Thanks for all you share of yourselves. So where are you now? Where are you going next? And, can you post an unobstructed view of the new wrap? This is why you’re such a great ambassador for the equine community; you take the time to interact with strangers and seem to really enjoy doing so. So many in your position treat these encounters as a nuisance. I hope to see that trailer here in Colorado someday! Just another reason you’re such a great ambassador for the equine industry. You take the time to visit with strangers and truly seem to enjoy it. So many in your position would treat these encounters as a nuisance. 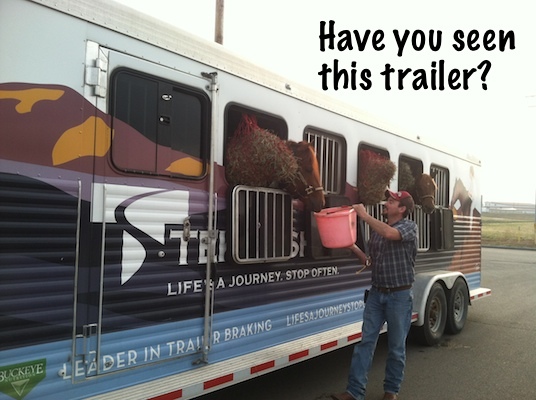 I hope to see this trailer up here in Colorado someday!